Hounslow West is a London Underground station in Hounslow of the London Borough of Hounslow, West London. It is located on Bath Road (A3006) about 600m from its junction with A4 Great West Road and Great South West Road (A30). The station is on the Heathrow branch of the Piccadilly line, between Hatton Cross and Hounslow Central stations and is in Travelcard Zone 5. The station has an island platform reached by stairs. There is step-free access for wheelchair users only. 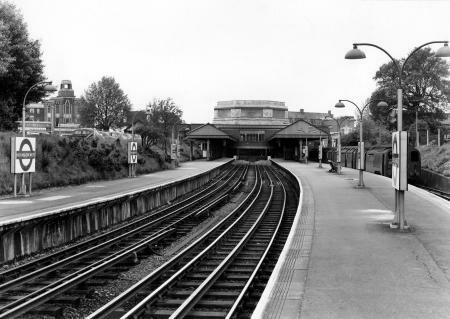 The station was opened by the District Railway (DR, now the District line) on 21 July 1884. The station was originally named Hounslow Barracks in reference to the Cavalry Barracks, Hounslow south of the station on Beavers Lane. The station was the terminus of a single track branch line extension from the DR's existing route to Hounslow Town station (now closed) on Hounslow High Street. The original station building in the early 1900s. The branch line diverged from the main route about 300m east of Hounslow East station, although Hounslow East was not opened until later, and when the branch opened there were no intermediate stations between Hounslow Barracks and Osterley & Spring Grove (now Osterley). In My Early Life, Winston Churchill recalls travelling on the Underground Railway to Hounslow Barracks two or three times a week whilst living at his mother's house in Knightsbridge around 1896. The DR's tracks were electrified between 1903 and 1905 with electric trains replacing steam trains on the Hounslow branch from 13 June 1905. On 1 December 1925 Hounslow West, Hounslow Central and Hounslow East stations received their current names. The current Hounslow West station building, which was retained when the platforms were resited underground. 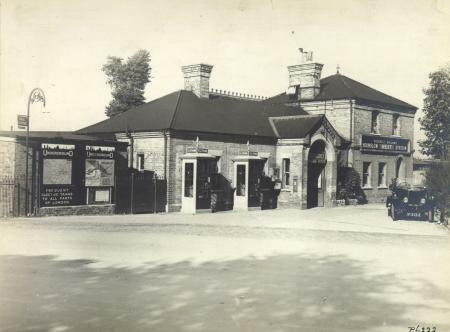 During 1930 and 1931 a new station building was constructed facing on to Bath Road to replace the original building which was parallel with the tracks and set back at an angle from the road. The new building, by the Underground's architect Stanley Heaps in conjunction with Charles Holden in a style reminiscent of Holden's designs for the 1926 Morden extension of the City and South London Railway (now part of the Northern line), was constructed in Portland stone and features a tall heptagonal ticket hall with glazed screens to all sides. The original building was gradually demolished as the new one was built and the new building opened on 5 July 1931. The building is very similar to the reconstructed station at Ealing Common built at the same time, also by Heaps and Holden. 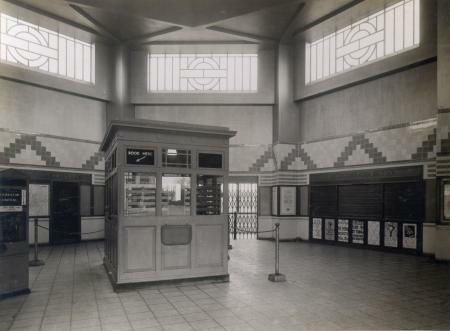 Basil Ionides designed the interior of the ticket hall at Hounslow West tube station. 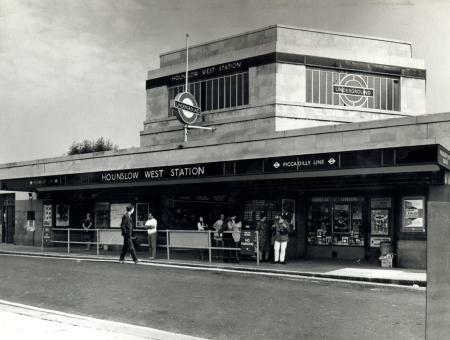 Piccadilly line services, which had been running as far as Northfields since January 1933, were extended to Hounslow West on 13 March 1933. From that date, the branch was operated jointly by both lines, but District line services (which had more capacious higher carriages) were progressively reduced to just rush-hour services in the late 1950s and withdrawn on 9 October 1964. 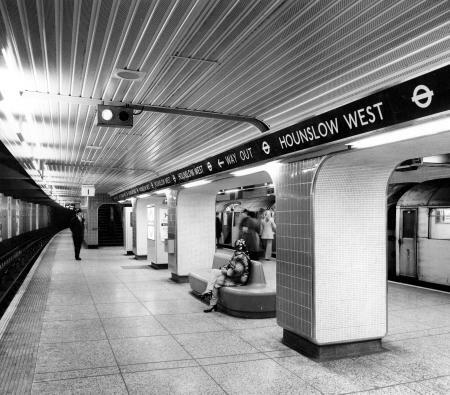 In the early 1970s work began on extending the Piccadilly line from Hounslow West to Heathrow Airport. The original alignment of the tracks and platforms at Hounslow West was SW/NE. If the tracks had been extended directly on that alignment towards the airport, much of residential west Hounslow would have had to be demolished. Instead, a route needing little demolition was found by following the Bath Road and Great South West Road in a cut and cover tunnel in a trench alongside the road which passed the Traveller's Friend junction around 1971. The line surfaces briefly over the River Crane before descending towards Hatton Cross and under Heathrow. Extending the District line to Hounslow West again is still a possibility which has recently been re-evaluated, although it cannot continue to Heathrow as the extension was only built to tube line standards. The first phase of the extension works was to build two new platforms at Hounslow West in a covered trench with a more westerly alignment to reach the chosen route. The new platforms were adjacent to and to the north of the existing three platforms, and the access from the 1930s station building was extended to reach them. The new platforms were brought into use on 14 July 1975 and the line was opened as far as Hatton Cross five days later on 19 July 1975. Train frequencies vary throughout the day, but generally operate every 3–7 minutes between 06:01 and 00:01 in both directions. London Bus routes 81, 203, 222, 482, H28, H32, H91 and H98 and night route N9 serve the station. ^ a b "Step free Tube Guide" (PDF). Transport for London. January 2019. Archived (PDF) from the original on 11 March 2019. ^ Historic England. "Hounslow West Underground Station (1241237)". National Heritage List for England. Retrieved 28 July 2013. ^ a b c d e f Rose, Douglas (1999). The London Underground, A Diagrammatic History. Douglas Rose/Capital Transport. ISBN 1-85414-219-4. ^ Churchill, Winston. My Early Life: 1874-1904. ^ Day, John R; Reed, John (2008) . The Story of London's Underground. Capital Transport. p. 66. ISBN 1-85414-316-6. ^ a b Day, John R; Reed, John (2008) . The Story of London's Underground. Capital Transport. p. 99. ISBN 1-85414-316-6. ^ Historic England. "Hounslow West Station (509368)". PastScape. Retrieved 14 October 2013. ^ "Ken Livingstone Mulls District Line Extension". Londonist. 14 April 2011. Archived from the original on 17 April 2011. ^ Day, John R; Reed, John (2008) . The Story of London's Underground. Capital Transport. p. 178. ISBN 1-85414-316-6. ^ "Piccadilly line timetable: From Hounslow West Underground Station to Hounslow Central Underground Station". Transport for London. Retrieved 28 February 2015. ^ "Piccadilly line timetable: From Hounslow West Underground Station to Hatton Cross Underground Station". Transport for London. Retrieved 28 February 2015. ^ "Buses from Hounslow West" (PDF). Transport for London. 25 February 2012. Retrieved 28 February 2015. Wikimedia Commons has media related to Hounslow West tube station. "Hounslow West". Photographic Archive. London Transport Museum. Archived from the original on 26 January 2014. "Hounslow West station". Abandoned Stations. Archived from the original on 17 August 2008. 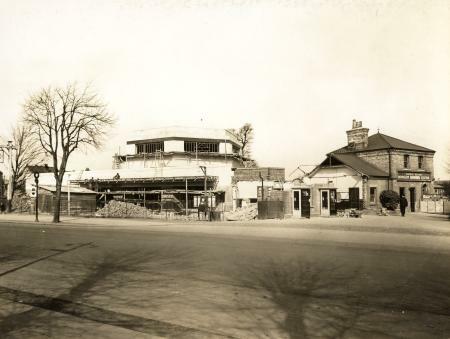 "Hounslow West and Hounslow Barracks ca.1926". Britain from Above. Archived from the original on 26 January 2014. Churchill commutes to Hounslow ca. 1896. This page was last edited on 29 January 2019, at 08:23 (UTC).